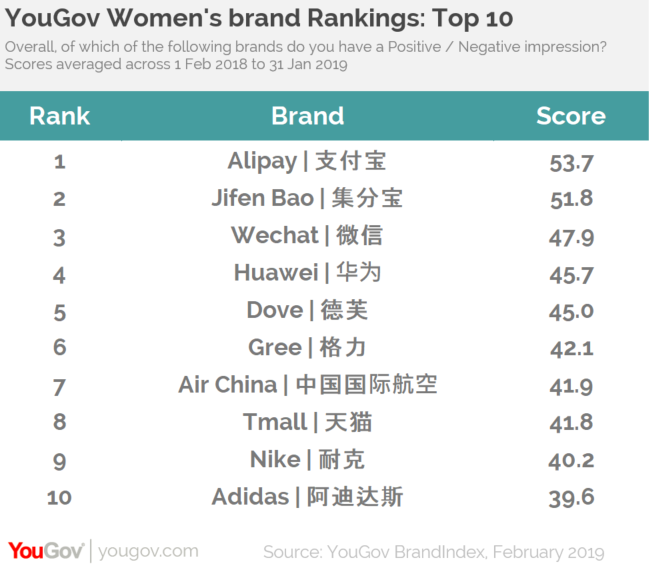 on March 5, 2019, 2:33 p.m.
Alipay tops YouGov Plan & Track’s annual list of the best-rated brands among women. 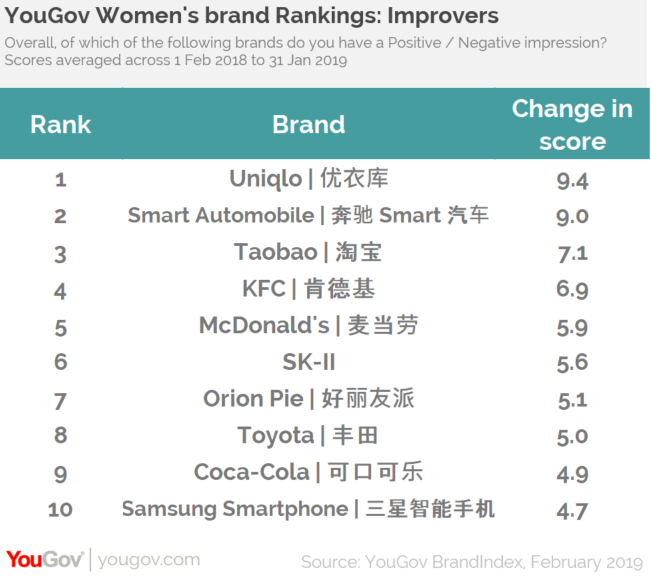 YouGov’s rankings look at the brands that have left the most positive impression on women in China. Alipay comes up on top, with a score of 53.7, followed by Alipay partnered rewards programme Jifen Bao in second (51.8). Instant messaging app WeChat in third (47.9), electronics manufacturer Huawei in fourth (45.7) and ecommerce site Tmall in eighth (41.8). The list is completed with brands from a variety of industries. Confectionary brand Dove comes in fifth (45.0) and whitegoods manufacturer Gree in sixth (42.1). Competing sportswear brands Nike (40.2) and Adidas (39.6) come in ninth and tenth respectively. The rankings also reveal which brands have seen the biggest increase in impression among Chinese women in the past year. Uniqlo takes the top spot with a score increase of 9.4, followed by German smartcar manufacturer Smart Automobile (up +9.0 points) and ecommerce platform Taobao (up +7.1).